Faridabad: Delhi Metro Rail Corporation (DMRC) has joined Treasure Vase Ventures Pvt. Ltd. will operate e-rickshaw services in Gurugram and Faridabad, a media report said on Saturday. The two partners marked a fleet of 150 e-rickshaws from the Escorts Mujesar subway station on Saturday. This is only the first fleet that will cover four metro stations in Faridabad, namely, Mujesar Escorts, Bata Chowk, Neelam Ajronda Chowk and Old Faridabad. 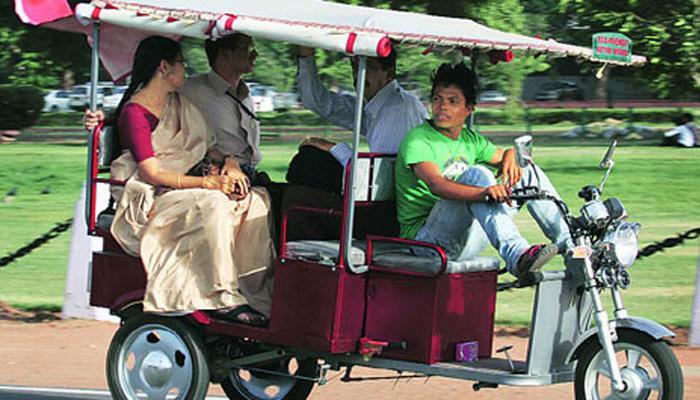 By 2018, 1000 E-rickshaws will cover all stations that fall in Faridabad, the newspaper quoted the Millennium Post. This green initiative to introduce e-rickshaws at Metro stations will allow travelers to prefer non-polluting public transport modes to personal vehicles. The goal behind the provision of last mile connectivity is to promote the use of public transport and provide quick, reliable and easy access to Metro stations and transit points / destinations, said the Director of DMRC (Operations) Sharat Sharma.